What’s more fun that buttons?! I love this design and I definitely love these Fall colors. 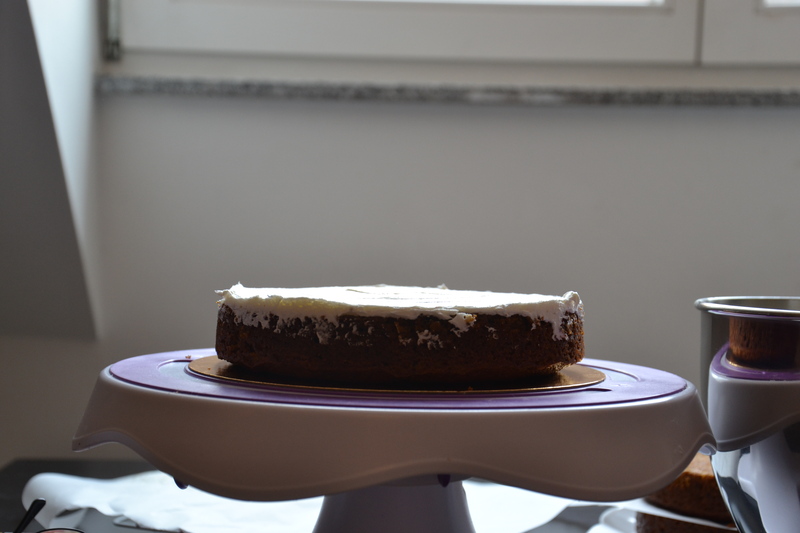 Last December I created a very similar cake and wanted to approach it again for a new season. It still makes me happy just looking at. It’s time for all the pumpkin things! 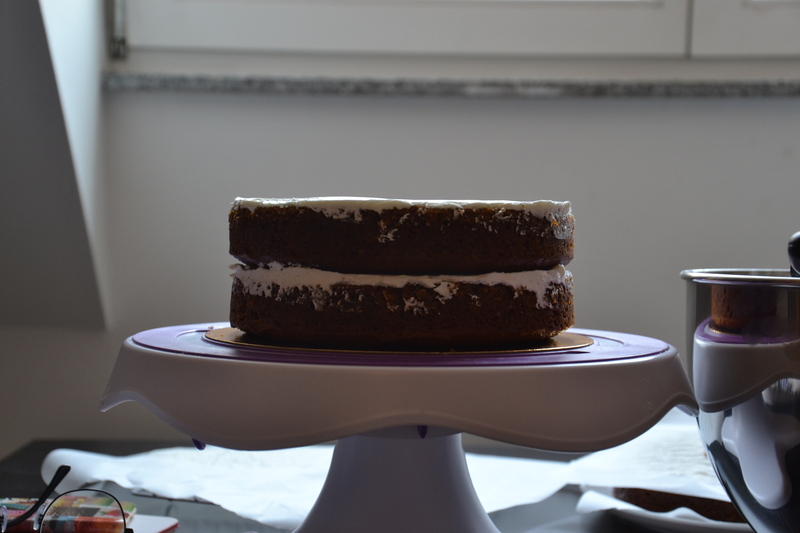 And this Pumpkin Layer Cake is definitely a keeper. 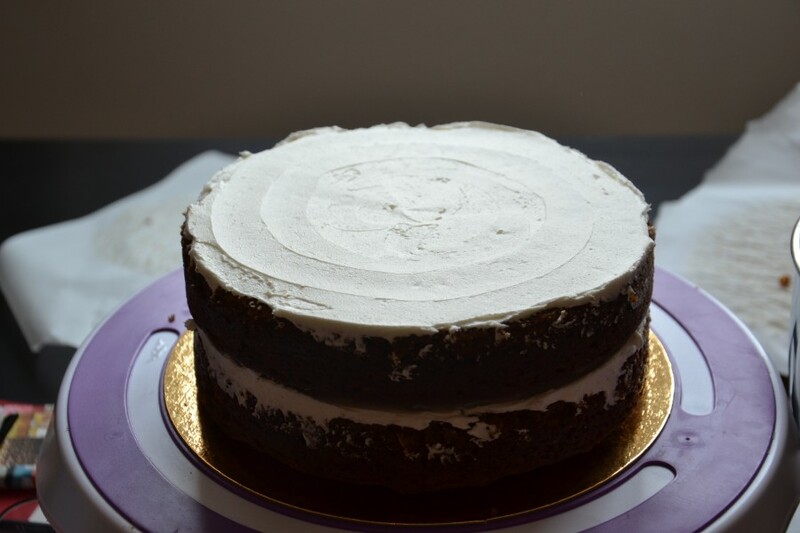 It’s terrifically moist and delicious – we prefer walnuts in the mix, but it’s not necessary, especially if this cake is going to a party where some of the guests might be allergic. 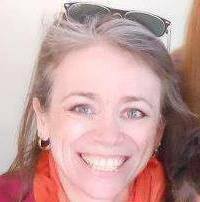 I’m thinking of my dear friend Autumn C. who taught me to consider nut allergies in my baking and I’m grateful for that every day. 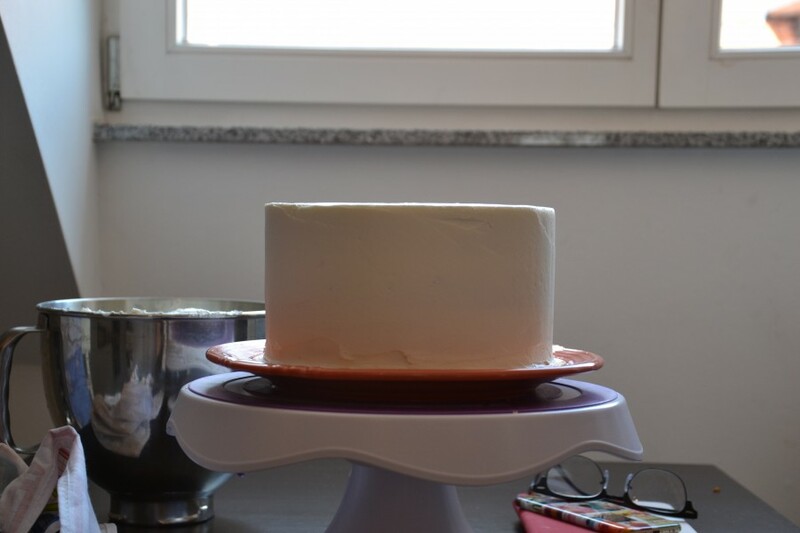 Baking the sponge is the easy part for this cake… those buttons are labor intensive. Or, it’s likely I over-complicate the production. But let’s get to it. 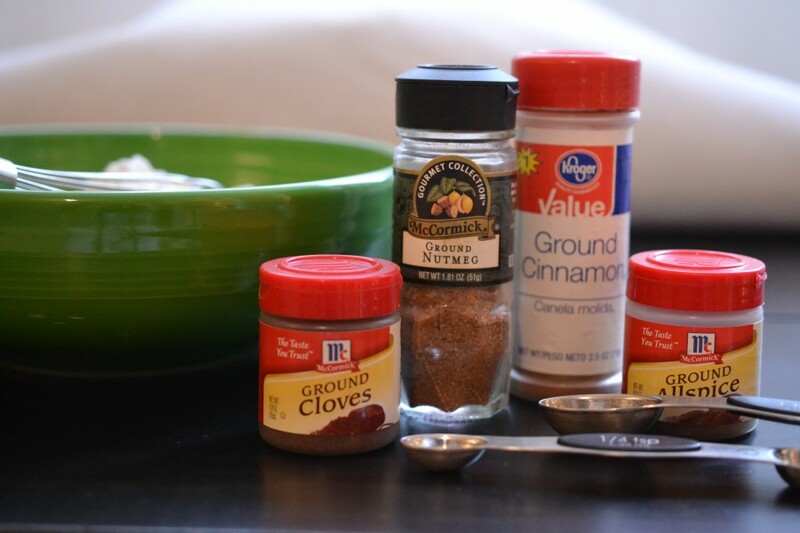 I happened to have all the separate spices and didn’t rely on a predetermined Pumpkin Pie Spice. I’ve used it before and it’s wonderful. 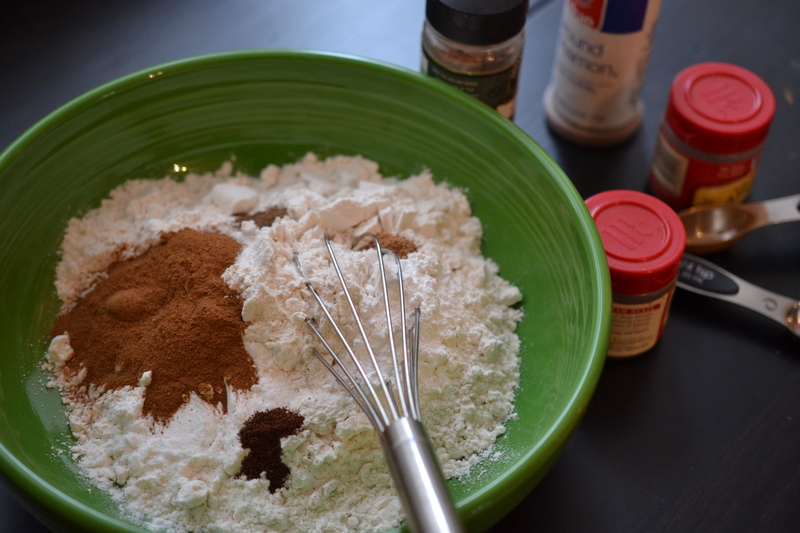 These spices were added to the flour, baking soda, baking powder, and salt … then set aside until after the wet ingredients were completely mixed. 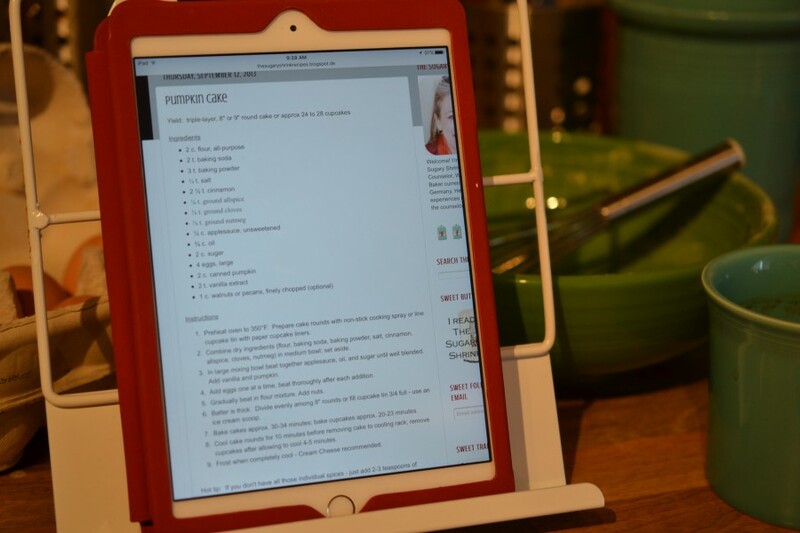 I follow my own recipes on my mini iPad …and love my new recipe book stand. 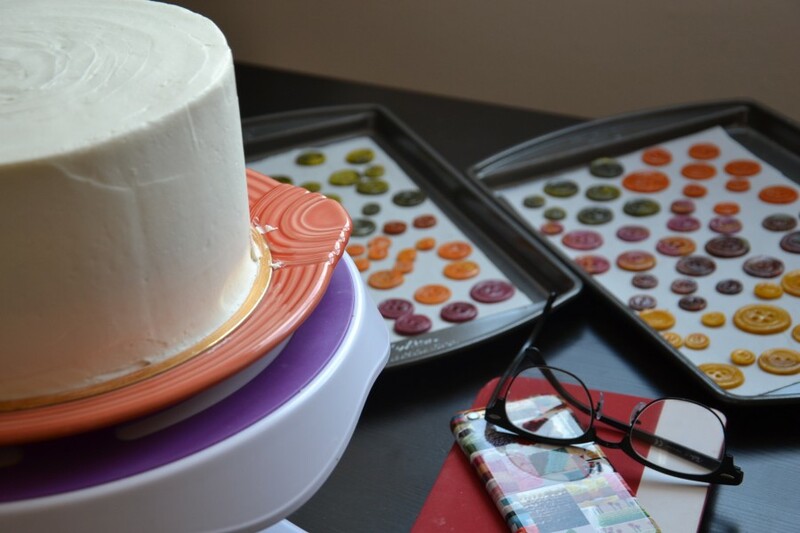 With the cake finished and cooling, I prepared to form dozens of Marzipan buttons. These decorations can be done 1-2 days ahead of time or same day, but they seem to be easier to handle if allowed to sit overnight. I began by gathering my tools: commercially prepared Marzipan (readily available in my nearby market, but might be a bit tricky finding it in some areas of the U.S.), gel coloring, toothpicks, rolling pin, parchment paper, pans, round cutters, a cornstarch/powdered sugar mix, paper towels, light corn syrup, and television remote. Because this takes me a while, I binge watch Netflix at the same time. 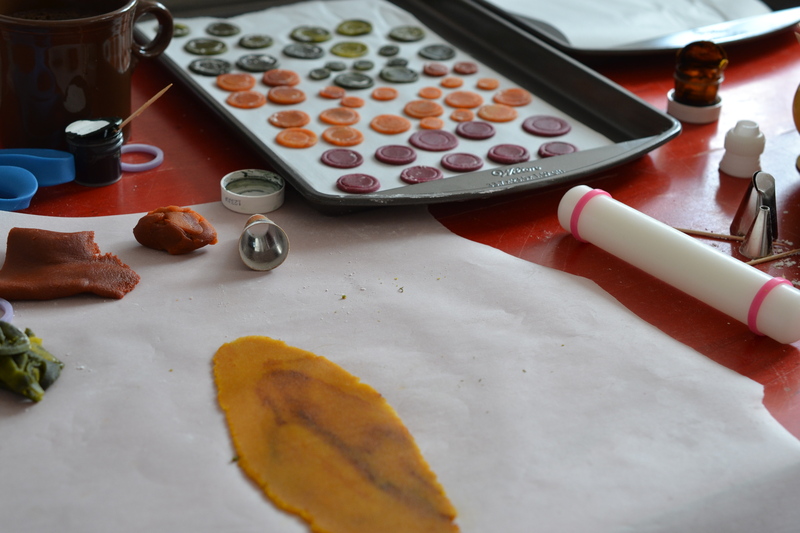 I pinch a piece of Marzipan about the size of a small plum from the brick of paste. 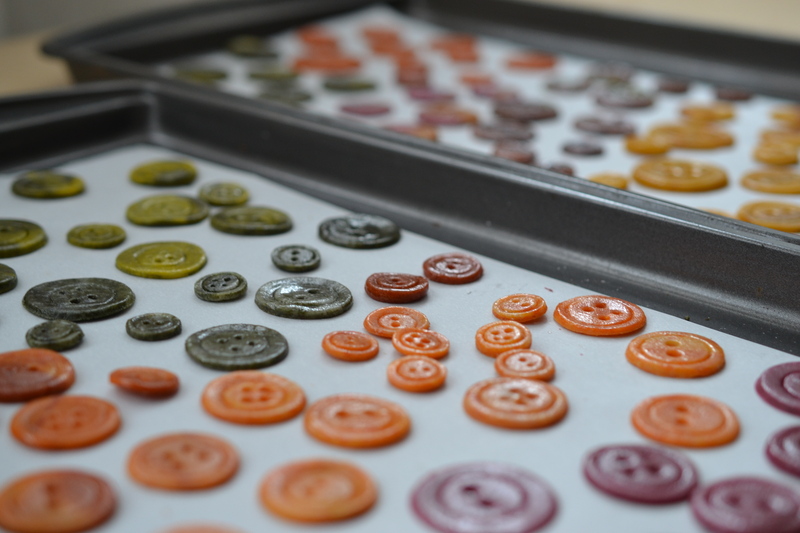 Then, add color – integrating 100% produces uniformly colored buttons… leaving some streaks gives the buttons a more organic appearance that echoes the Fall leaves. 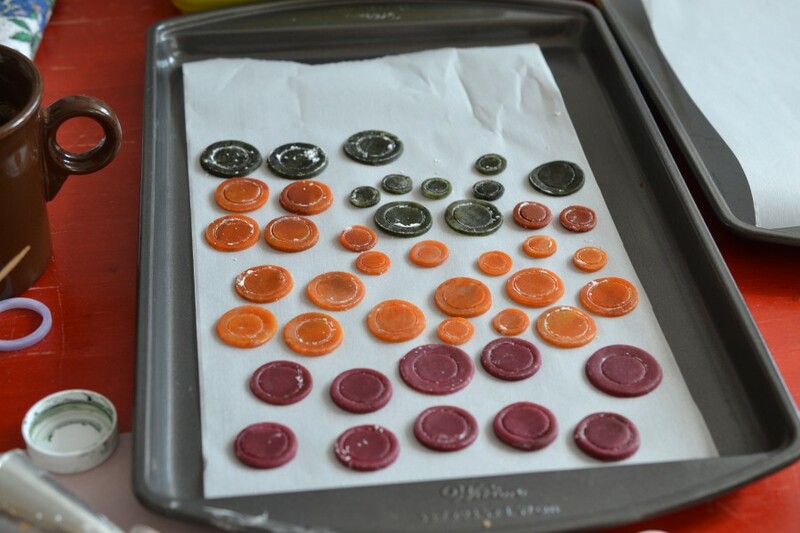 I placed all the buttons on parchment paper because the Marzipan is a bit sticky – made stickier with the coloring gel. 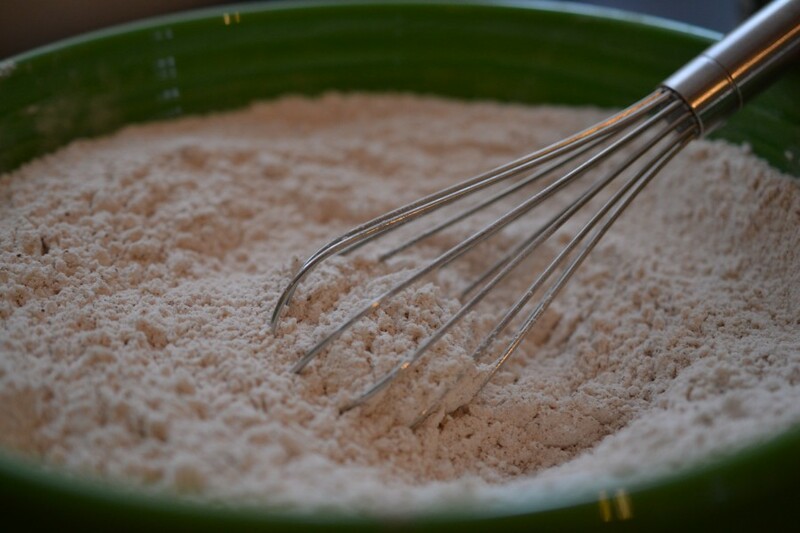 Dipping the round cutter into the cornstarch/powdered sugar mix helps release the buttons from the cutter…mostly. I need legit round cutters! 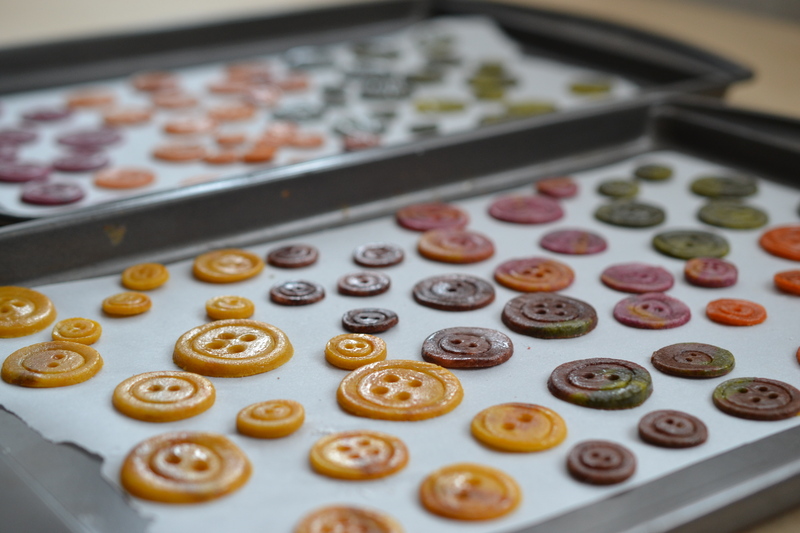 For this production, I used a variety of my piping tips to cut, score, and puncture the buttons. All of the cutting is done including the light smaller indent, then I go back and make the center holes. 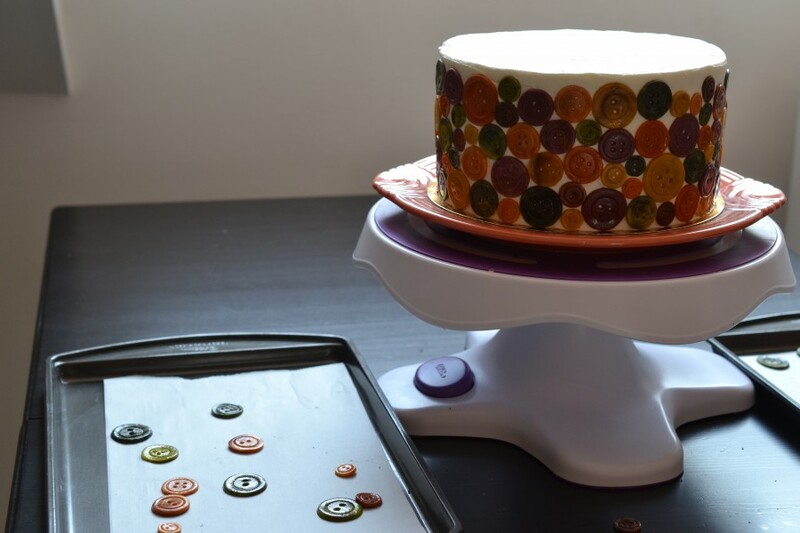 The final step is a light smearing of corn syrup – it absorbs the cornstarch/powdered sugar mix and leaves the buttons shiny. 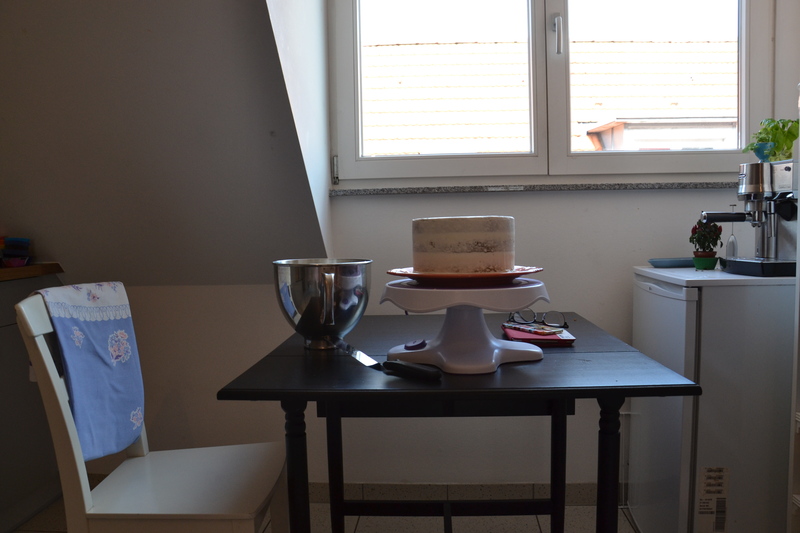 With the buttons finished, it was time to build the cake. These are some lovely, even layers. 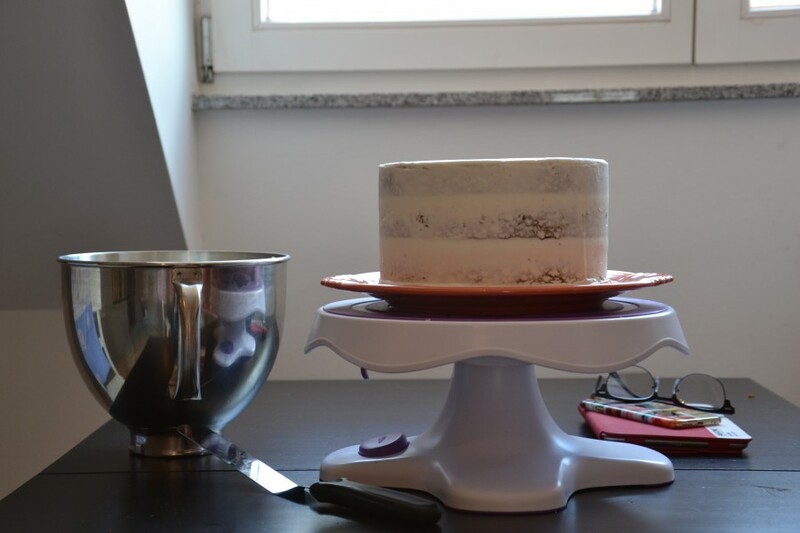 As a gentle reminder – weigh the empty pans, then weigh pans with batter, allow for differences, aim for equal amount of batter in each pan, and be prepared for your own even layers. 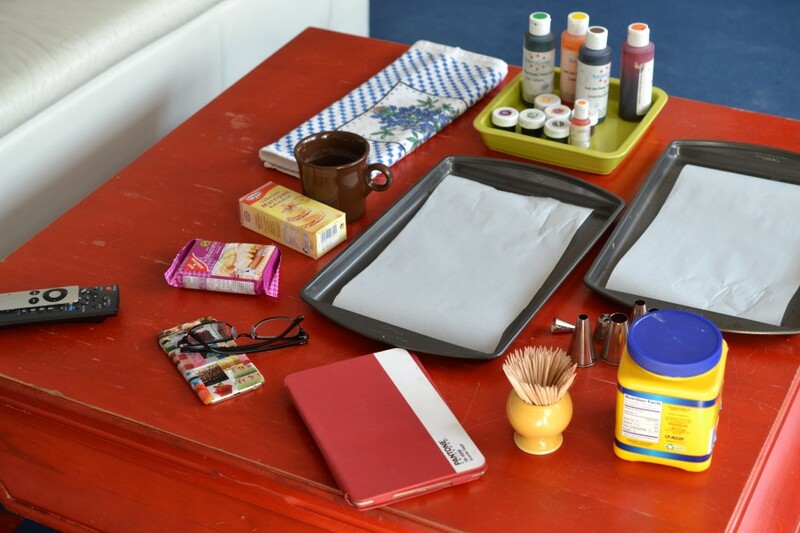 My work/design space is our kitchen table. 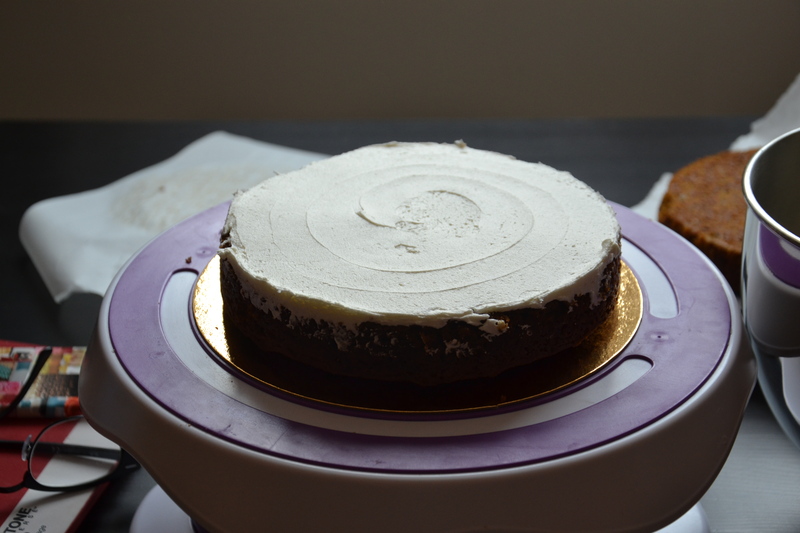 A Vanilla Buttercream crumb coat is delicious with the Pumpkin Layer Cake. 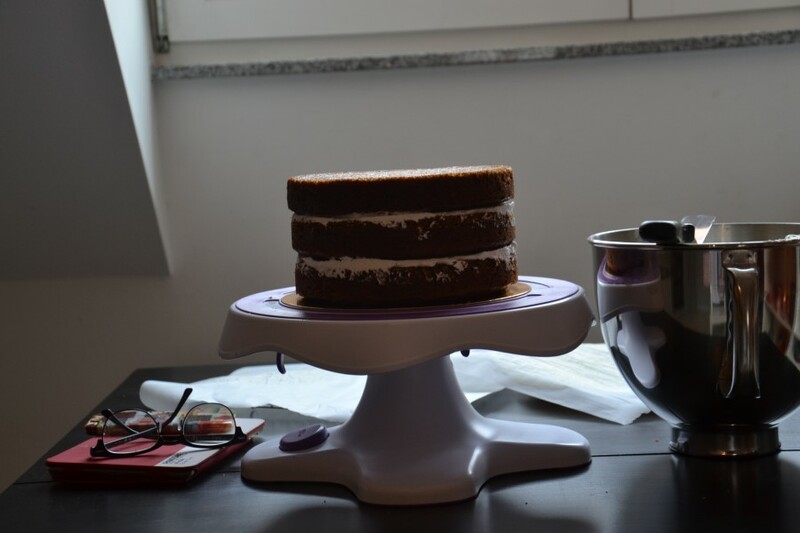 This right here is a beautiful cake – I’d add some flowers to the top and call it done. 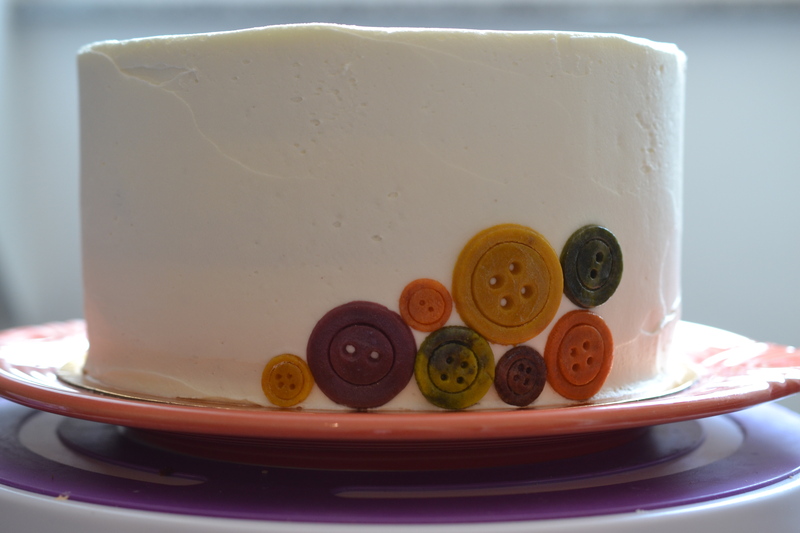 But, the buttons need a bit more buttercream to stay on board. I really love this design. 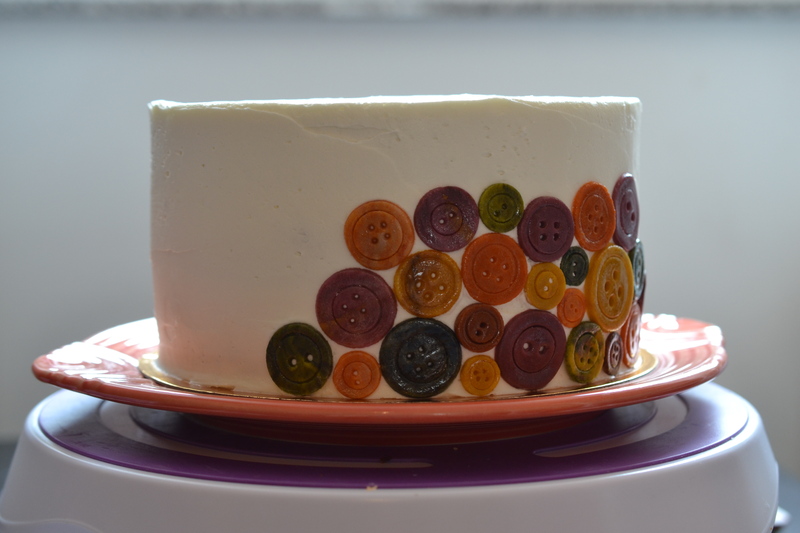 When I worked with this style of button last December, I decorated the cake only half-way up with buttons. This time I wanted to add more… not sure which design I prefer. It’s great to live one day at a time. It’s great to be surrounded by our people – even long distance. It’s great to enjoy the love of an amazing and capable life partner.